Evan H. Farr, CELA, The Virginia Nursing Home Survival Guide. Clifton, VA: Quality Legal Publications, LLC, 2006. 151 pages. Most long-term care guides are for a nationwide audience, not for residents of a specific state. But while Congress and the federal government set out the main rules for regulating and paying for nursing home care, each state runs its own Medicaid program and the rules are somewhat different in every state. 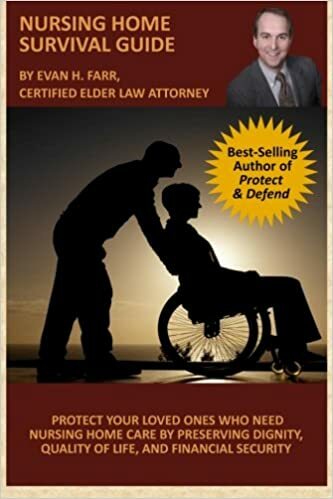 That's why Virginians are fortunate that Fairfax ElderLawAnswers member attorney Evan H. Farr has written a concise, readable guide to choosing a nursing home and the payment options in the Old Dominion. In addition to outlining the specific Medicaid rules that pertain in Virginia, the book offers guidance on selecting a nursing facility -- including a very detailed nursing home evaluation checklist -- and explains how to get the best care and recognize abuse and neglect. The Virginia Nursing Home Survival Guide is also filled with helpful lists of Virginia contacts, including names and addresses of nursing homes by region of the state, contact information for local Area Agencies on Aging, and the names of geriatricians and geriatric care managers in different Virginia cities, from Front Royal to Bristol.